Boil aloos and mash well. Grind together dhania leaves , green chillies and hing powder. Add this paste to the mashed potatoes and mix well so that there are no lumps. Knead the wheat flour with 2 tbsp oil, salt and water and keep aside for 1 hour. Take a sizeable portion of the dough and make a dent in the center as you would while making modaks. Take a portion of the aloo dhania mix shape it into balls and put it in the centre of the dough. Close it and roll out into parathas. Fry them on a tava and serve with butter on top and chilled dahi. 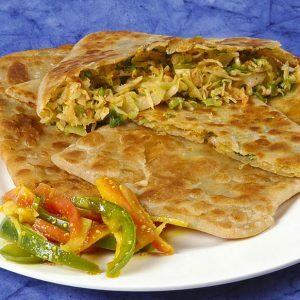 Feel free to comment or share your thoughts on this Aloo Dhania Paratha Recipe from Awesome Cuisine.